Dogs require their teeth for much more than just chewing their food. A dog uses his teeth in the same way we rely on our hands to lift and carry objects, move things out of the way and to defend ourselves. As with humans, poor dental health can lead to serious chronic illnesses such as liver, kidney and heart disease, so it is vital to take extra special care of your companion’s pearly whites. 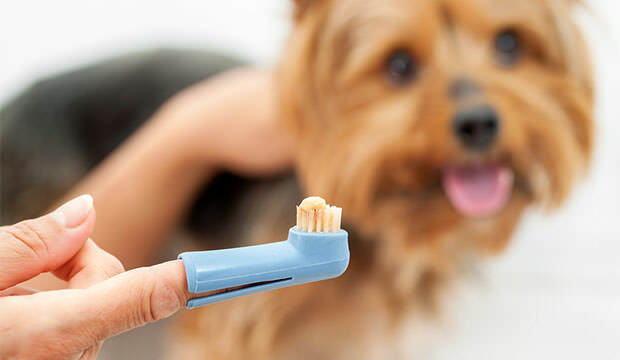 Even if your dog has a sparkling set of teeth worthy of a toothpaste commercial, it is still advisable to brush his teeth at least every few days. Waiting until the damage has already been done will result in pain, gum problems and the removal of teeth, not to mention a substantial vet bill that could run to several hundred dollars. Most pet stores sell specially designed dog toothbrushes with extra-long handles. Alternatively, you could purchase the type that slips over your finger. Always purchase specialist toothpaste from a pet store as human toothpaste contains fluoride that is highly toxic to dogs. 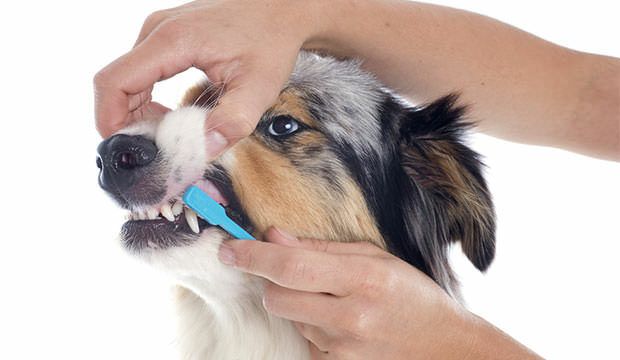 With a little patience and determination, you can get your dog used to having his teeth brushed at any age. However, it will be much less stressful for the both of you if you start him off as a puppy. 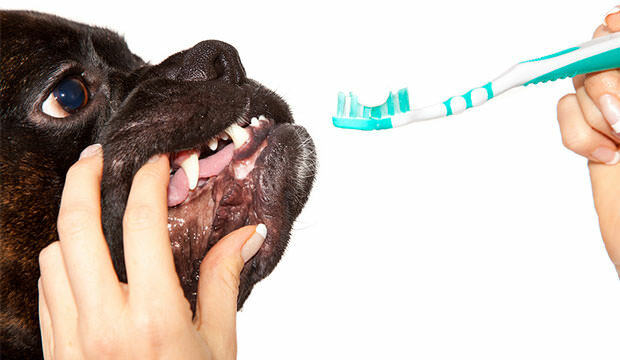 Start by placing a little of the toothpaste on your finger, and rub it across your dog’s teeth and gums. Continue this for a few days until he gets used to it. Slowly start introducing the toothbrush for only a few seconds at a time. 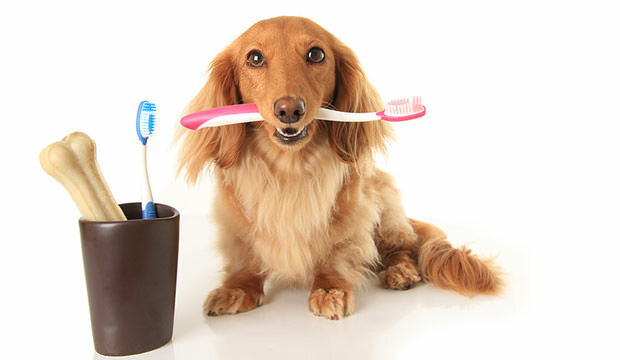 Gradually build up the amount of time until you are able to brush your dog’s teeth for at least one minute every day. The best time to brush your dog’s teeth is just after a walk when he will be more likely to sit still. Try to stick to a set routine so your dog knows what to expect. If he needs a little extra incentive to allow you to clean his teeth, prepare his food first, and then leave it up on the table or kitchen counter. 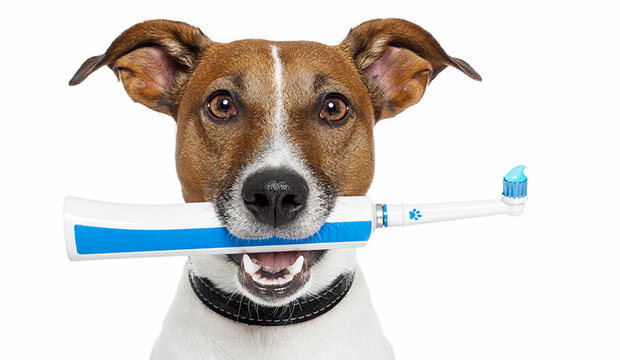 Show your dog the toothbrush before gently trying to open his mouth. Every time your dog allows you a little further into his mouth with the toothbrush, praise him enthusiastically and immediately put down his food. 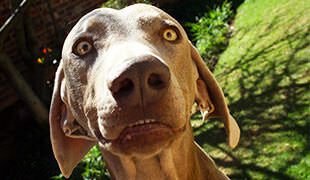 At least once a month, lift your dog’s lips and thoroughly examine his teeth and gums. Look for any discoloured, chipped or misaligned teeth and any that have a brown or yellow build-up of plaque. 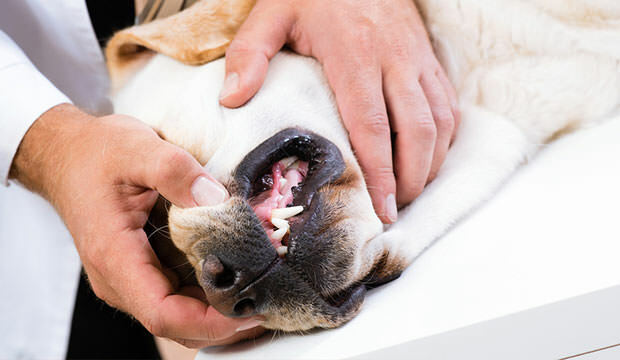 Check your dog’s gums for signs of swelling, bleeding, pain or redness. Run your finger along the gums and under the tongue to look for any cysts or tumours that may be present. While dog’s breath is never particularly sweet-smelling, an unusually foul smell could be a sign of periodontal disease. This is a serious infection that can spread throughout the body if it is left untreated. Always include some form of dry biscuits in your dog’s diet. Crunching dry biscuits helps to clean the teeth and remove tarter build-up. Wet dog food coats the teeth and will quickly result in discoloration, decay and possibly even broken teeth. Purchase the appropriate dry food according to your dog’s size as smaller breeds will struggle with regular size biscuits. 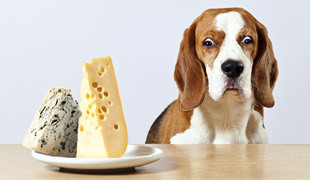 If your dog refuses to eat biscuits, try mixing them in with his regular wet food, or wrap them in pieces of chicken or ham. Even if the biscuits soften a little before eating, it is still better than consuming wet food alone. There is a wide range of specially designed treats and toys that can freshen your dog’s breath, clean his teeth and protect against gum disease. 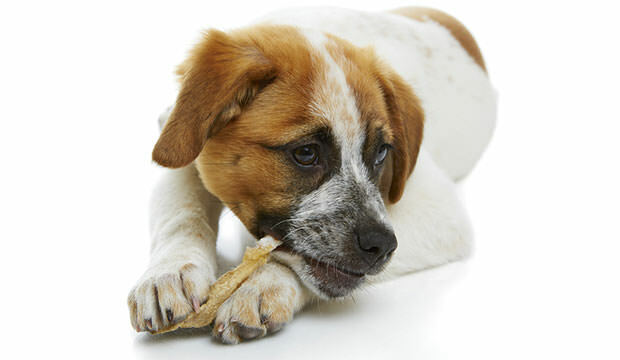 Visit a good quality pet store to search for a dental bone that is filled with dental paste. As your dog chews through the bone, the paste will slowly coat his teeth and gums helping to remove plaque and harmful bacteria. 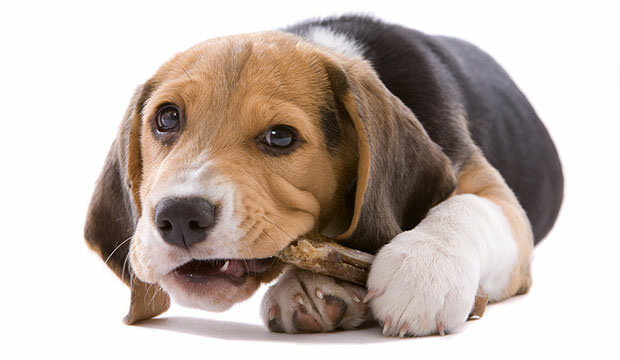 Rawhide bones are also a good option for teeth cleaning. Pet toy manufacturer Kong offers an entire range of dental chews that are specially designed to protect your dog’s teeth and freshen his breath. If you spot a broken or rotten tooth, take your dog to the vet immediately for a professional opinion. Removing the tooth as soon as possible will stop the decay spreading to the other teeth. A severely infected tooth can also cause serious health complications that can affect different parts of the body. Some owners feel it is better to wait until the dog shows signs of discomfort before arranging to have the tooth removed. It is far better for your dog to have any rotten teeth removed immediately as he will quickly adjust to the missing tooth after a short period of time. Visit your local butchers to pick up a good bone for your dog. Even the most delicious synthetic chews cannot compete with the real thing, so try to give your dog a bone that’s appropriate to its size at least once per month. 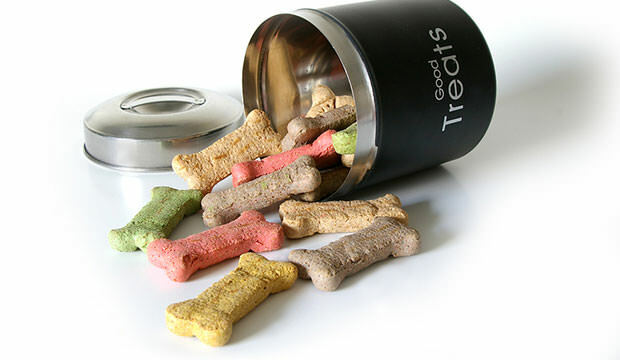 Beef knuckle bones make fantastic treats, and your dog will be blissfully happy for hours on end. You may want to serve this particular treat outside or on a balcony as they can be extremely messy. If this is not possible, let them chew the bone on a hard floor such as linoleum or tile to avoid small pieces of meat getting lodged in your carpet or rug. 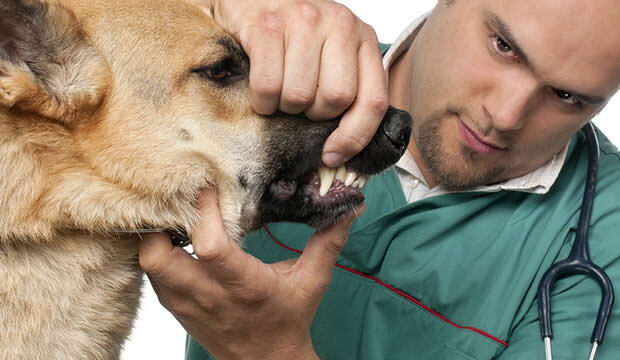 Neglecting your dog’s dental health can result in illness or even death in the most severe cases. A long-term infection in the mouth can easily pass into your dog’s bloodstream causing serious damage to the organs. The early detection of tumours is also vital to ensure effective treatment. Signs that your dog may be experiencing oral discomfort include excessive drooling, foul-smelling breath, change in eating habits and pawing at the mouth. They may also become depressed, withdrawn and lose interest in playing and activities they previously enjoyed. If your dog exhibits any of these symptoms, take them to a veterinarian right away. As soon as you have finished brushing your dog’s teeth, shower him with praise and reward him with a treat. 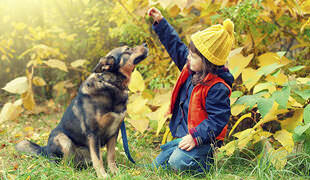 Once your dog begins to associate the experience with a positive outcome, he will be far more likely to submit and allow you to complete the task. Finding a flavoured toothpaste that your dog really enjoys will also help the process along, so experiment with different kinds until you find one he likes. Even if it takes months of gentle encouragement and painstakingly slow progress, it will be worth it to avoid any unnecessary pain and suffering for your best friend. I recently adopted a stray dog that I found and it’s teeth are in really bad condiiton. I took her to a pet dentistry where they removed a few of her rotten teeth. I had no idea that that would be an important thing to do. Are there dental implants for dogs? I am just wondering because I want her to have the best quality of life that I can give her and I would really like to have those missing teeth replaced if possible. A dental toothbrush like that one looks similar to the one that a vet specialist gave me last week. He checked my dog’s teeth and found cavity in one are of his mouth. This issue got me worried and wanting to know how that happened. I like the tips to start slowly and reward the dog early. My dog clearly doesn’t like my fingers in her mouth. I think the most important key is practice. If you can help your dog get used to the sensation, they might even grow to enjoy it.